On the velvet chair, Velázquez has painted the likeness of a dog for which he felt great affection, ‘so that death would not rob him of her completely’, according to the catalogue. 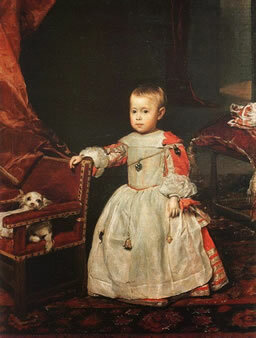 Perhaps this was also why the portrait of the Infante was commissioned by his royal parents. His fragility and the formality of his surroundings seem at odds. For me, it is the chaos of accident and illness that we can never fully tame nor control, no matter how much earthly power we have, that hides in the shadow at the back of the picture like a giant mouth. And in my mind, this portrait stands for all those that were never painted, of the loved and the lost. wondering if you pose a threat. on velvet like a discarded glove. His amulets may draw your gaze next. play with an incense ball. he is pressed and pinned and prayed for. hiding the throne on which he will never sit.